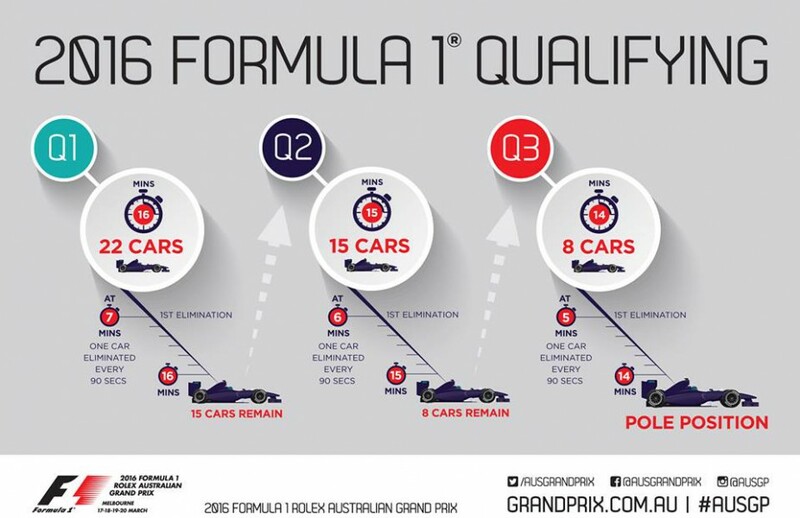 The 2016 season of Formula 1 is in it’s second race weekend and there is some discussion about the way the qualifying is going. With the first race in Australia the Q1 and Q2 were OK to watch as there were a lot of cars on track to begin with, but Q3 was done with 7 minutes still on the clock. It seemed to me that the teams did not get the new system as a lot of drivers went out of the pit with no chance of setting a time, it looked to me that they thought they were able to finish the lap they were on when their time ran out, which was not the case, some teams learned quickly and did it right in Q2 already, but some still got it wrong. Social media blew up with people saying the new system sucked and it needed to go back to the old system, which worked and was exciting to watch. The powers that be decided during the next 2 weeks that they would give it another go in the next race in Bahrain, which was yesterday afternoon. Well, the teams did seem to get the system now, as drivers were going on the track at the right time and drove themselves out of elimination and pushed others in, but with 4 minutes to go in Q1 and Q2 all drivers were in the pit and nothing happened anymore. This is because the top teams got out in the very beginning of those sessions, set a fast time in 1 lap and went back in to wait it out. Q3 seemed to go the same as the first time, but because Hammilton set a bad time his first time around he had to go out another time, which caused other to try again too, but with 4 minutes to go everyone was in the pit again and it was done, this would have been 5 minutes if the red light at the end of the pit would have gone to green when the timer for Q3 started. So, what needs to change? Going back to the old system does not seem to be an option for some reason, so whats my idea for a new qualifying system? The elimination system is something that I think can be fun, but you need to give people time to react to times set by other drivers, so I would get rid of the 3 session system en just use 1 long session, lets say 1 hour (but that might need some tweaking). We start out with 10 minutes ‘free’ driving, so everyone can set a time, after that a timer starts, 90 seconds is OK (depending on the time it takes to do a lap, so that might need to change for different tracks), but people are allowed to finish the lap they are in when the time runs out, so when you are in the pit when your timer starts, you have time for the out lap and a fast lap. This would however mean that the top teams will set 1 fast lap in the beginning and would be done, but the times would reset after a set amount of drivers are out of qualifying, lets say each 5 drivers (22, 17, 12, 7, 2) which means that in the end the top 2 drivers need to do a shootout for pole. With the teams understanding that the remaining of the 90 seconds will go to the next driver (as they seemed to do in Bahrain) I think we would see more people on track. Tagged 2016, F1, Formula 1, Qualifying.